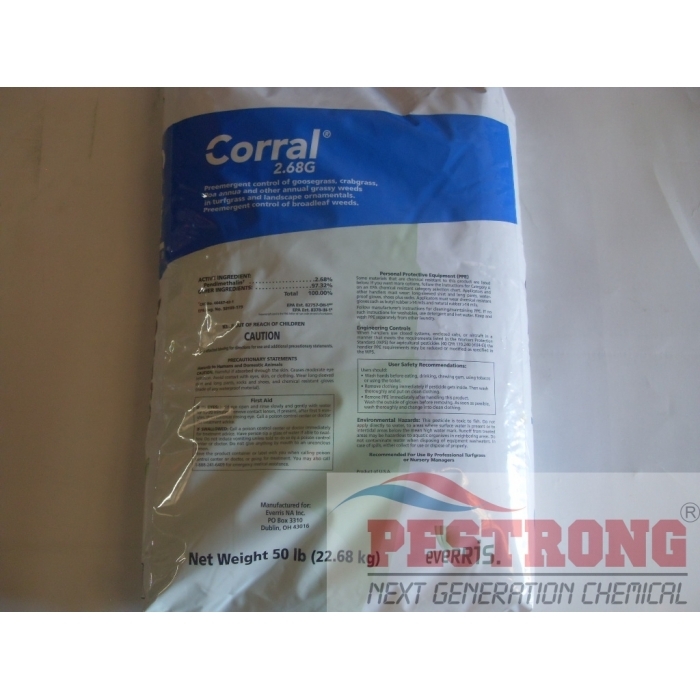 Where to Buy Corral 2.68g, Corral 2.68G Granules Herbicide Pendimethalin - 50 Lb - $94.95 for Sale with Fast Free Shipping! Corral 2.68G Granules Herbicide Pendimethalin - 50 Lb is a consistent, long-lasting pre-emergent herbicide that provides broad-spectrum control for a number of troublesome weed. Corral 2.68G Granules Herbicide Pendimethalin - 50 Lb is a consistent, long-lasting pre-emergent herbicide that provides broad-spectrum control for a number of troublesome weed problems including annual grasses, spurge and chickweed. Proven effective in all nursery conditions, Corral is labeled for turf and landscape ornamentals. Corral 2.68G Granules Herbicide Pendimethalin - 40 Lb controls more than 40 grassy and broadleaf weeds in all — including troublesome weeds like oxalis, henbit and spurge. A friend recommended this for me for preemergent control. The price for this wasn't too bad so I bought some and will give it a try. I will see how this works out in the spring of next year.